Perhaps it will have better luck on DVD. 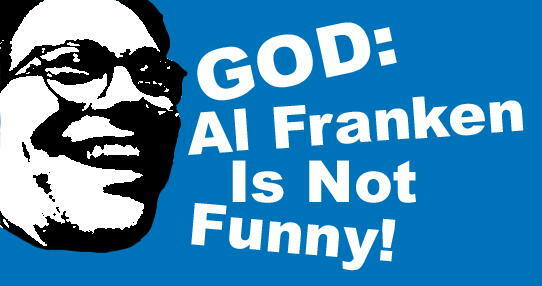 After several weeks in both limited and general release, Al Franken: God Spoke appears to be a genuine big screen flop. So far, it has generated just $64,600 in ticket sales, according to The Numbers.com, a box office- tracking website. Last week, God Spoke ranked a mere 60th overall, among films in current release. Even now, it's being shown on just ten screens nationwide, with several additions expected this weekend. And despite an avalanche of positive coverage in the true spirit of Frankenfluff, which included reviews in hundreds of publications across the country, the alleged documentary has simply failed to catch on. Click here for a rare negative critic's assessment of the film. With Air America Radio now suffering through its final miserable days, God Spoke might have represented a way for Franken to keep his increasingly- troubled career on track, but it's now clear this effort isn't going to do it, either. FOR THE LATEST on key Massachusetts races, visit Bay State Showdown, our other site. Your Amazon orders that begin with clicks here, regardless of what you ultimately purchase, greatly help to support this site's efforts. Thanks again! You do realize that the movie opened in 2 theaters and its widest release was ten theaters? The Franken movie has no audience. The Franken radio show has no audience. I wonder what they have in common? The left will claim it's not the content. The left will claim it couldn't be the so called "star". Any idea why the Bush Administration restricted the release of the movie to just ten theaters? The nutroots on the left will be claiming the culprit must be Karl Rove. It certainly could not be due to the audience demand. I think this blog is great, but you ought to consider putting Old Glory or the Stars and Stripes and the WA State flag on your blog please. Of 131 movies shown in the USA that weekend Godspoke came in 7th in per screen box office. In its second weekend it did $3,000. Of the top twenty movies, that was the third best per screen box office. 1st Weekend: The reason none of the Top 40 had a per screen average that high was because all but 4 of them had at leat 100 screens. The more screens, the lower the per screen average. Simple math, my friend. Besides, God Spoke wasn't competing against Gridiron Gang or Black Dahlia. It was competing against the likes of US vs. John Lennon and The Ground Truth. Both of which, BTW, grossed more than Franken's flick. Weekend #2: God Spoke wasn't in the Top 20 (or Top 85 for that matter), so you can't compare a film to a subset of which the film is not a member of. Look, I don't think anyone imagined this would do Inconvenient Truth numbers. Otherwise, they would have released on more than 2 screens. Still, it's slightly underperformed even it's modest expectations. But it's not even performing to the level of it's competitors such as Lennon and Who Killed the Electric Car. As such, it's dying on the vine and can be fairly labeled as a bomb. (Just like Jesus Camp). The people who did buy tickets probably thought they were going to see Jackass 2 and left midway through this absolute debacle. Who would have thought audiences wouldn't flock to a movie about an ugly, unfunny, androgynous, stupid, middle-aged little runt? Just the libs who are wrong about everything else as well. "1st Weekend: The reason none of the Top 40 had a per screen average that high was because all but 4 of them had at least 100 screens." The way you judge the success of these little no budget Indies is by the screen count. The reason this movie opened in two theaters is because it costs 1500 - 2500 dollars for each film print. Ideally that number should be matched by an equal amount for advertising. This movie was made by two guys with a video camera. If this movie bombed the first weekend they would never have invested more money into it and expanded the theater count to 10.